Hello! It’s lovely to meet you. Let me tell you a little bit about myself. I have a younger sister Rose and a younger brother James. James is at Yale right now. I recently graduated from Wellesley College and am now back home living with my parents in our Madison Avenue apartment. The country is coming out of the Depression and New York City in 1938 is an exciting place to be! Unfortunately my mother’s expectations are for me to settle down and join the usual social whirl of my class—lunches, charity events, dinner parties. And of course all that would be in aid of my finding a suitable husband—someone with a good name and a sizeable bank account. I became quite passionate about photography when I was in college and was able to study with my roommate’s aunt—a well-known photographer. I couldn’t bear the thought sitting at home planning tea parties so I joined the staff of the Daily Trumpet. I’m just a girl Friday, but when an opportunity arises, I plan to work my way up to becoming a crime photographer. It all happened sooner than I expected when Ralph Kaminsky, a veteran crime reporter, took me along on an assignment to photograph the debutante ball at the Waldorf-Astoria Hotel. Who knew we’d find ourselves at the scene of a murder? If you could do/be anything, what would it be? AND NOW FOR OUR SUMMER #GIVEAWAY! I'm giving away a copy of Bought the Farm, #3 in my Farmer's Daughter series, to one person who comments below. US only please. 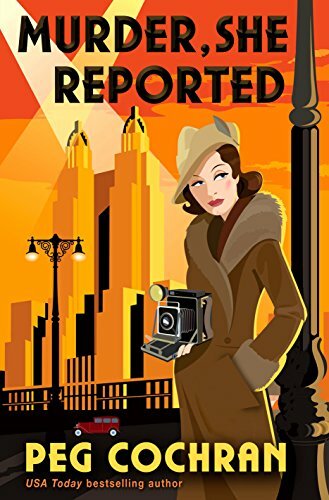 Murder, She Reported is a great read. I would love to do anything related to forensics. I would love to open a quilt shop in my town and sell books on the side! I would really like to work in a book store or library. Looking forward to reading "Murder, She Repoted". Great cover and storyline. I would like to have a bookstore/tearoom. I'd like to be more of a world traveller. Would love to have a book store combined with a craft store. This series is one I really enjoy! I’ve read # 1 and #2 is next to be read....so having 3 would be wonderful! Love your books Peg Cochran! I would love to study volcanoes. I've always wanted to have my own fabric/used book store and live around the Amish. Thank you for the wonderful chance to win a copy of "Bought the Farm". I would love the opportunity to read it! I would open a coffee/tea café/bookstore that would allow pets. Of course, food prep would have to be strictly pet-free per food safety regulations. Thank you for the chance at this giveaway. 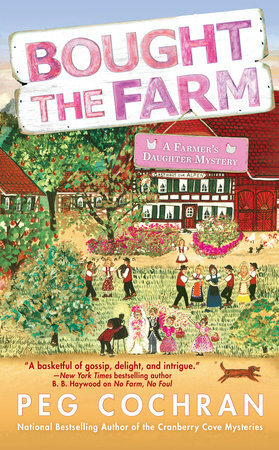 I love cozy mysteries and Bought the Farm sounds great! love this series. really looking forward to reading this newest title. Thank you for the chance!